There is a large amount of snowfall in the Tri State. The heavy snow and wind are impacting the area with blizzard like conditions. The snow is expected to continue for a few hours and may lighten up around mid night. Authorities in the area strongly advise for people to stay inside and remain cautious during this type of weather. ” We really encourage everyone to stay home tonight. That’s the safest place to be. There is no doubt that we will have a certain amount of slide offs and crashes tonight. 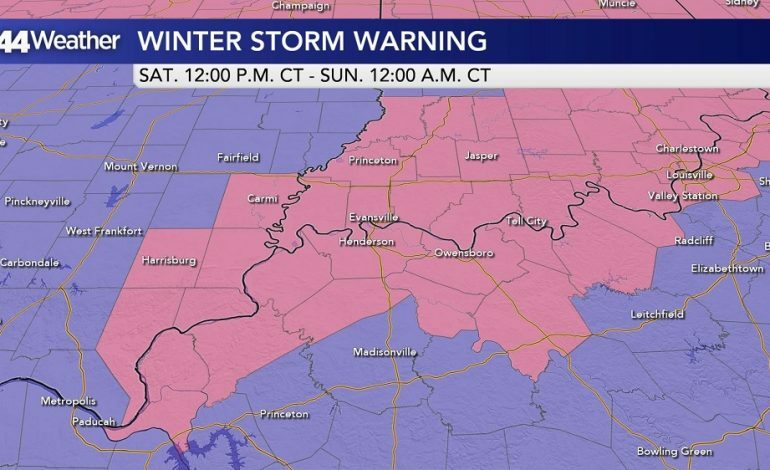 Our biggest concern is people not having a plan and not having a winter survival kit, possibly freezing,” said Indiana State Police Sergeant Todd Ringle. ” If you have to go out tonight for example you have to work a mid night shift or something. Please make sure that your spouse or friend knows the route you’re taking. Make sure you have a cell phone, that way if for some reason you don’t show up for work we can find out the route of travel,” said Ringle. The wind is between 20 to 40 mph now and will more than likely continue through the night. The wind chill is in the tens and twenties. It is expected to be in the single digits Sunday morning.